I can’t mention enough how my growing body is making me venture out of my usual classic style. I love button down shirts and large sweaters. As the weeks go by and I am approaching my 3rd trimester I am slowly not able to button up my shirts, and I’m also starting to feel huge in my oversized sweaters. Looking in my closet, I’m trying to put together some of my looser fitting pieces so that I don’t have to invest too much money on new clothes. There are obviously some maternity items I need to purchase, and I am happy to do so. I found this cute summer dress in the back of my closet, and since LA weather has been so warm, I was able to wear it in December while giving it a fall twist. 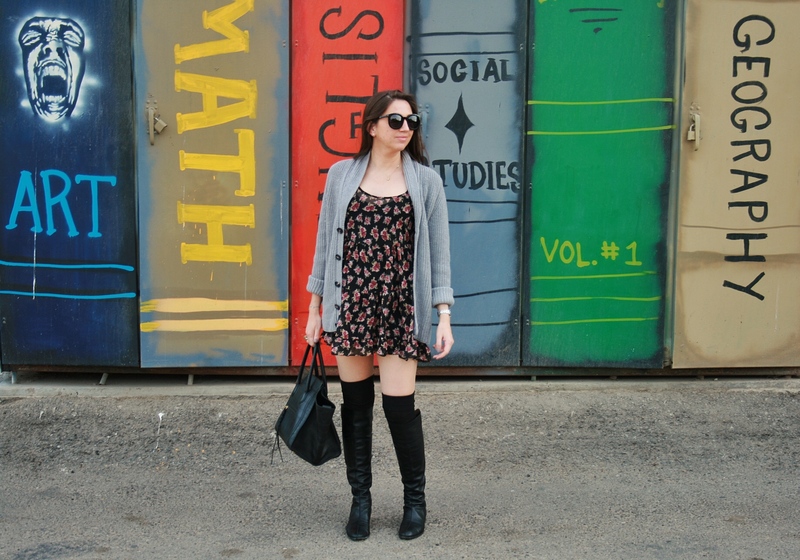 I added an oversized cardigan with over the knee socks and my favorite black boots. I felt cute and flirty in this look with the added bonus that it was very comfortable and flattering to my changing body. I suggest pregnant or not, take a look in the back of your closet and pull out that piece that’s been sitting there for a while and try to incorporate it into your next look. Its like getting a new item all over again. That is such a cute look! Flirty, and cute, and you’re pregnant at the same time. I love, love, love the outfit.